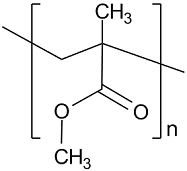 Poly(methyl methacrylate) [MW ~ 185,000] | Polysciences, Inc.
Poly(methyl methacrylate), also called PMMA, is a low cost thermoplastic polymer with many applications to everyday life. Highly transparent PMMA is an ideal replacement for glass where impact or weight is a concern. PMMA is compatible with human tissue making it an important material for transplants and prosthetics, especially in the field of ophthalmology because of its transparent properties.